Are you an organisation who is involved with the preparation and/or delivery of Meals to clients in the community or at centres? SMS has additional modules available for organisation with rotating daily menus or delivering frozen based on frozen items. 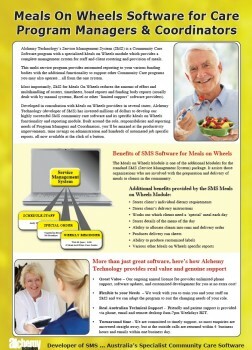 The module allows for labels, menus and run sheets for drivers as well as summary sheets for kitchens and management.